Taking its name from the city-state of Corinth, the Corinthian helmet pertains to the iconic classical gear that we identify with the ancient Greek hoplites, in spite of its relative disuse by the later decades of the 5th century BC (in favor of less constrictive designs). 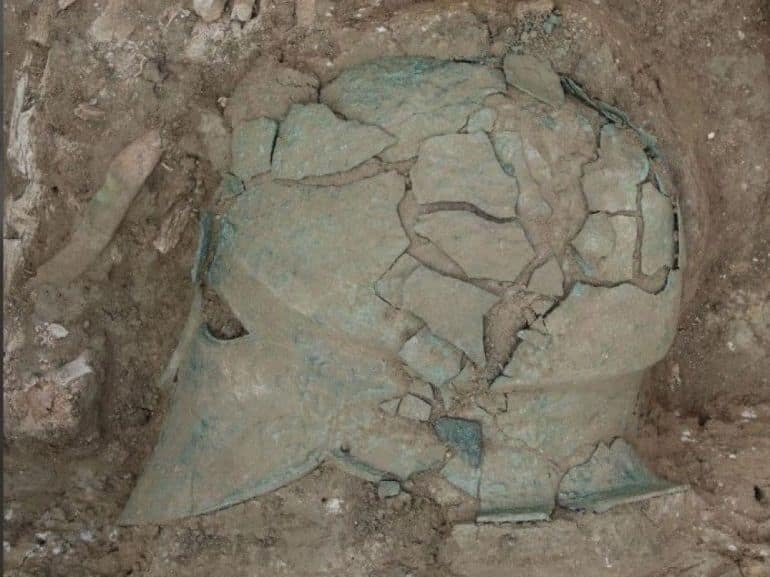 And in an interesting turn of events, archaeologists have come across the first known specimen of a Corinthian helmet north of Black Sea, in an area in the Taman Peninsula, south-west of Russia. The incredible discovery in itself was found in a fragmented form – an unsurprising state since the object was buried for over 2,500 years. 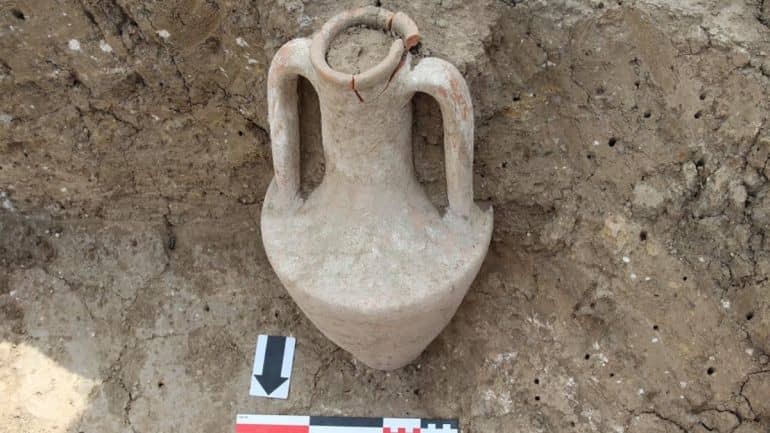 To that end, according to the researchers at Institute of Archaeology of the Russian Academy of Sciences (IA RAS), who took part in the excavation of the site, the Corinthian helmet possibly dates from the early part of 5th century BC. It can also be hypothesized that it belonged to a warrior, with the ancient Greek custom entailing the burial of the warrior along with his helmet. Suffice it to say, the helmet, like the shield, was perceived as a prestigious equipment in the ancient Greek world, with hoplites/citizens often showcasing their helmets in a place of honor inside their dwellings. As for the specific design attributes of the exemplary Corinthian helmet, the protective gear was usually made of bronze (or brass) and it tended to cover the entire head and neck, with slits for the eyes and mouth. In some specimens, an extending curved projection on the rear side protected the nape of the neck. However, in spite of its seminal status, the Corinthian helmet was gradually relegated in favor of more open-type helmets that allowed hoplites to observe and communicate better during combat scenarios. 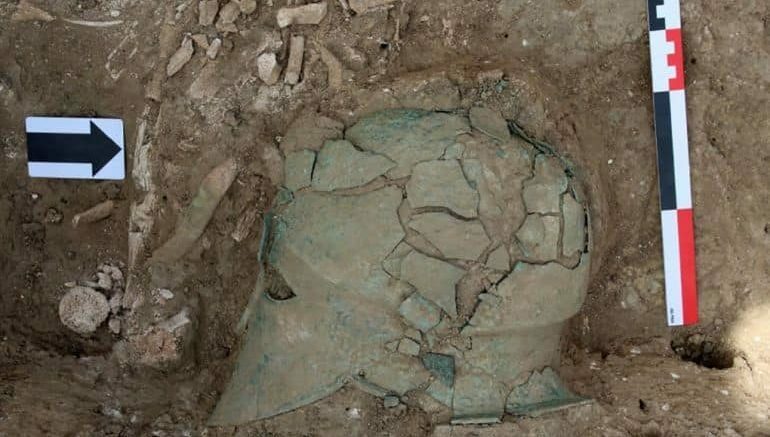 Reverting to the discovery in question here, the particular Corinthian helmet alludes to the ancient Greek presence in the area in and around Crimea, north of Black Sea. To that end, the Taman site, corresponding to ancient Phanagoria, is also home to a necropolis of 600 burial mounds where many Greek warriors of the Bosporus kingdom are buried. 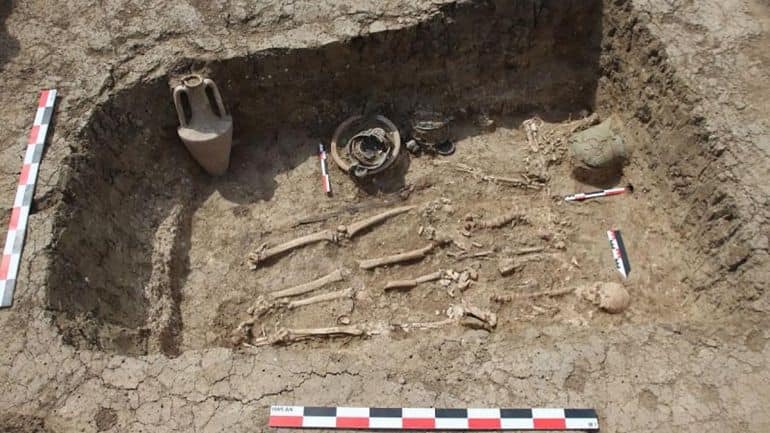 Historically, this Greek Bosporan Kingdom (Basileion tou Kimmerikou Bosporou) in eastern Crimea was founded in circa 5th century BC and was the successor to the Greek colonies already established in the region by circa 7th century BC. Quite intriguingly, the Bosporan Kingdom was administered as an ancient Greek mercantile state that prospered from its noted export of wheat, fish, and slaves to mainland Greece – so much so that at one point its capital Panticapaeum (modern-day Kerch) was the third largest city in the Greek world. As a matter of fact, the strategic value of the realm was not lost on the Romans who offered the client-state status to the kingdom (circa late 1st century AD) even after the subjugation of mainland Greece, thus making it the longest surviving client kingdom of the Romans. On the other hand, the kingdom also showcased its fascinating brand of cultural synthesis between the Greeks and the Eurasian nomads (Scythians and later Sarmatians), which was often mirrored by exotic artworks, including Bosporan architectural and sculptural specimens.